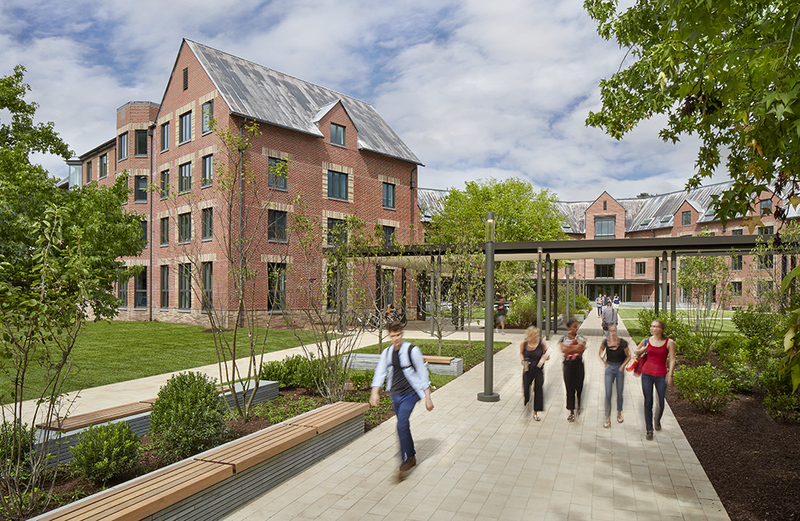 New Haven, CT Architects Pirie Associates has helped transform a concrete and masonry building, intended to be temporary, into a modern new extension to the Yale Law School, the first such expansion since Sterling Law Building was completed in 1931. The adaptive reuse of 100 Tower Parkway into Baker Hall was made possible thanks to a $25 million gift in 2013 from alumni Robert C. and Christina Baker, and a subsequent $35 million fundraising effort led by Yale Law School. Started in September, 2017 and completed this August, the renovation restores the marriage of academic and residential life to the law school, while honoring student requests for places to enjoy their downtime. The furniture, made with wood from felled urban trees, was provided by Hugo & Hoby, a local company founded by graduates of the Yale Entrepreneurial Institute. Post says they originally wanted the building to function as a dormitory, but Pirie encouraged them to reconsider that plan since it would have created a chasm between Baker and Sterling. Instead, they overhauled the entire structure to integrate programming and student needs.